Even if you do a lot of holiday shopping online, inevitably you end up at the mall….in long lines…waiting….standing. Then schlep through the snow back to the car carrying tons of bags. Where is the falalala in that? So you dress for comfort. Or, dress like you are about to run a marathon. But where is the style in that? Especially if you run into friends & co-workers. 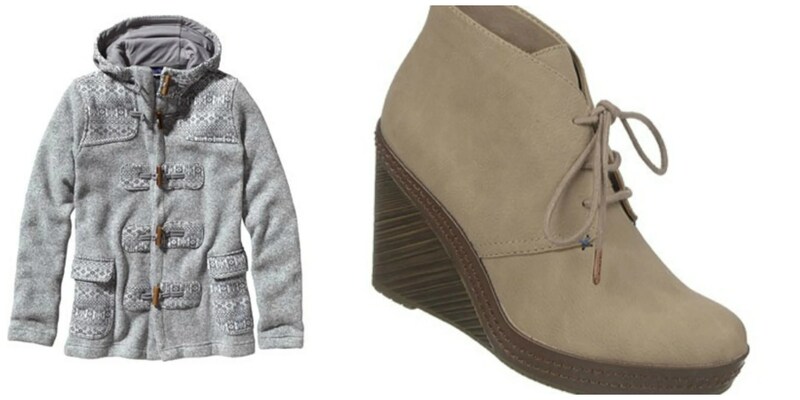 I can’t help if you don’t put on makeup, but put on a pretty sweater, jeans and one of my Shoebuy Top Winter Shoes! These are my five favorite styles on the Shoebuy.com site right now. I picked them because they are comfortable and stylish, perfect for shopping, cookie swaps, holiday concerts or Christmas parties. 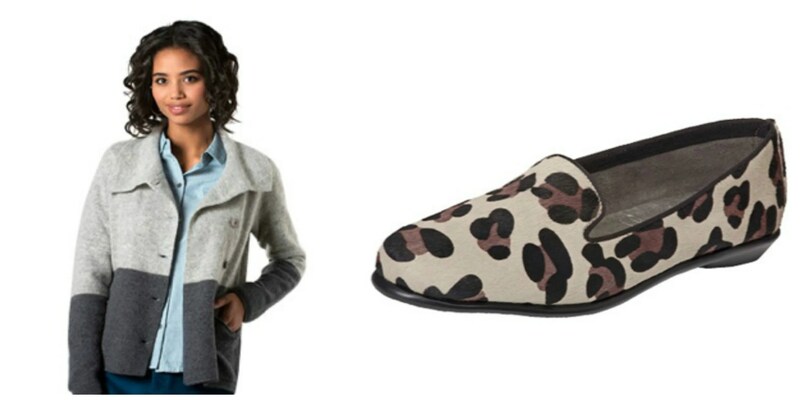 Put on this cute Merino Wool Top for $148.95, a pair of jeans, and then match it up with these Aerosole leopard black/gray cow hair Betunia flats for $68.95. These flats transform your outfit from a casual style into a pleasant surprise. Flexible sole and a richly cushioned footbed provide premium comfort when you need it most too. There are three other fabulous designs like tiger tan stripe, bronze, and black sparkle. 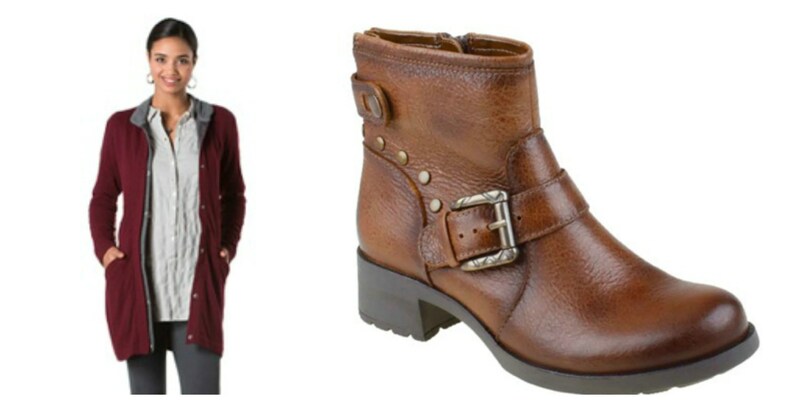 A little bit rock-and-roll with its chunky heel, oversized buckle and metal studs, these Earth Redwood boots are fabulous for everyday wear with its timeless leather and a great shaft height. Plus, the premium upper and glove-soft lining boot has a side-zip for easy on, easy off removal. The exclusive comfort footbed cushions your foot from heel to toe while the reinforced arch support and padded heel area offer all-day comfort and displace shock. Retails for $145.95 with three color options: light brown, dark brown and black. Pair with this Horny Toad Monterosa Car Coat and a pair of skinny jeans or leggings. I love my UGGs, but there are pairs that are more suitable to wear in public if you are over the age of 30. Don’t give up the comfort of UGGs but gain some style status with this UGG Emalie for $149.95. A fashion-forward alternative to the basic rubber rain boot, the sleek Emalie wedge boot is 100% waterproof with seam-sealed construction. A 2 1/2 inch decorative molded Spider Rubber outsole delivers added comfort and traction in rainy conditions. The steel shank provides malleability at the foot’s natural flex points. You can dash through the snow with these. Super cute when paired with this Prana Sweater Dress for $94.95, and a pair of tights. These Dr. Scholl’s Bethany wedges are a personal favorite as they can be dressed up or dressed down with ease. They feature a three eye lace-up front, a smooth lining, a cushioning insole with Memory Fit® Foam, a 1 inch platform front, and a traction outsole to make the icy walk back to the car. Retail value is $57 and pair with jeans and one of my favorite tops, the Patagonia Better Sweater Islandic Coat for $179.00. Lastly, check out these Sofft Toby boots for $139.95. In three colors in tan, stone suede, and black, it’s a timeless bootie with delicate slouching. 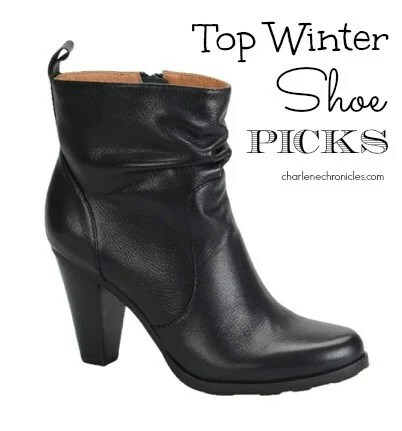 The Toby features a side zipper, lug sole, stacked heel, and a leather comfort footbed. Pair with black leggings or this Ibex Juliet dress for $169.95 for the hubby’s holiday party. Check out the holiday deals on Shoebuy.com. This Shoebuy promo code should help too! Just use “stylecomfort2014” and may you find comfort (and style) this season!